With the 200th anniversary of Dickens's birth, everything Dickens is being celebrated, from the trivial to the Gigantic; we are about to be blessed with duelling versions of Great Expectactions, still more Christmas Carols than we are usually inundated with, and even a Scottish Falsetto sock-puppet tribute (I'm not making this up). To render friendship still a toast. 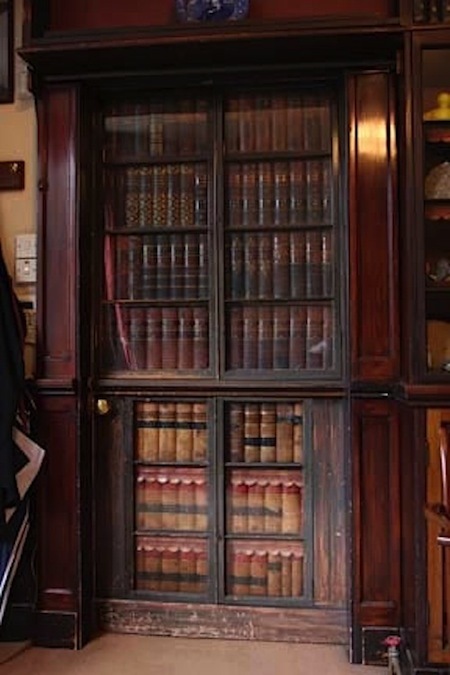 And there's more: just recently, I came upon an account in an 1880 issue of The Graphic, which concerned the practice of concealing a door within a library behind panels covered with imitation spines bearing dummy book-titles. 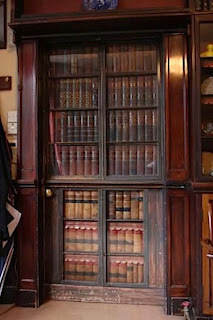 Thomas Hood, the author of the "Lament of Toby," was commissioned to prepare such a door for the Duke of Devonshire; among his titular facetiæ were such drolleries as "Lamb on the Death of Wolfe," "On Sore Throat and the Migration of the Swallow," and "Johnson's Contradictionary." Apparently, Dickens himself took up the idea, and had a doorway in his study at Gad's Hill Place so covered, inventing the titles himself. Among them: "The Quarrelly Review," "History of the Middling Ages," "Lady Godiva on the Horse," and -- here's the kicker -- "The Life and Letters of the Learned Pig." This portmanteau portal is still in place, and can be seen 'round about 3:42 seconds into this video tour of the house, although Toby's letters, alas, are not visible.